Woodpeckers may visit your home because they have located food, water or shelter. Their hammering serves to announce their territories, create nest cavities and attract mates. In those cases, the drumming will usually conclude when they have accomplished their goals, and this type of drumming causes little damage. Some people find the drumming annoying since it can be heard for quite a distance and is quite nerve wracking when heard throughout the house. The birds seem to enjoy drumming on noisy surfaces, such as metal gutters, chimney caps, rooftop vents and cooling units. Drumming may happen several times a day and may go on for days or weeks. The foraging done with this type of pecking is often advantageous since Woodpeckers eat damaging insects, including termites and carpenter bees, and the drumming is often an early warning signal of an insect infestation, but it can also cause damage to siding. When the Woodpecker searches for insects, his pecking is not as forceful, and instead of being the constant, rapid-fire hammering, it is more intermittent, so it is generally not as annoying as other types of tapping. Homeowners have a difficult time pinning down the location of the Woodpecker’s drumming. The birds will hammer on wood siding, attics, synthetic stucco siding, wooden shingles, cedar or redwood siding, metal or plastic siding and gutters, TV antennas, chimney caps, light posts—even cars! They seem to seek out materials that will produce the most reverberation. These attacks are not only destructive to the materials, but they can also create unsanitary conditions, particularly in attic areas. Woodpeckers startle easily and are taken off task quickly, so their presence is unpredictable, and the location of the damage might be challenging to locate. Fortunately, drumming is an activity that is mostly performed in the spring, and during the early morning and late afternoon times. It usually ends by the first of July. Unfortunately, that’s not much consolation when one is trying to sleep! Woodpeckers need dead or dying trees and snags (severed projections from a limb or stump) to excavate their nesting cavities. Human encroachment on wooded areas containing old-growth trees and the clearing of dead trees have drastically reduced the availability of such nesting sites, and Woodpeckers are challenged to find suitable alternatives. If your building or home is being assaulted by Woodpeckers, one solution might be to erect several nest boxes on nearby trees or sides of buildings. Place cavity-type nest boxes on buildings near the areas where Woodpeckers (especially Northern Flickers) have been inflicting damage. Nesting Woodpeckers will defend their territories to keep other Woodpeckers and other birds or animals away, so it’s important to put up more than one or two boxes. If the nest box attracts starlings, paint the interior of the box white. Starlings apparently do not like light-colored interiors. Alternatively, mount a starling-sized box near the Woodpecker box and temporarily cover the Woodpecker box hole to encourage the starlings to move to the smaller box. Although they prefer to excavate their own nest sites, Woodpeckers will utilize nest boxes when other sources are unavailable. However, occasionally woodpecker single out a house for drumming, a ritual that occurs when m ales set up territories and attract their mates. At that time they make their presence known by "drumming." Normally they pick a resonant dead tree trunk. However, as more homeowners remove dead trees, woodpeckers may turn to metal gutters, house siding and television antennas. While drumming may be aggravating, it usually doesn't physically damage your house. You can eliminate the drumming noise by deadening the resonant area. Fill the hollow space with caulk. If that doesn't work, create a physical barrier by screening the drumming site with hardware cloth, sheet metal or nylon "bird netting." You might encourage the bird to leave altogether by creating an alternative drumming site nearby (but away from your bedroom window). Here's how to make a drum: Fasten two overlapping boards, the back board firmly secured and the front (covered with metal sheeting) nailed to it at only one end. Serious structural damage occurs when woodpeckers drill holes in unpainted, untreated plywood and cedar siding, window frames and roofing. While no one knows for sure what attracts a woodpecker to a house, your first step in eliminating the problem is to check for signs of insect infestation -- carpenter ants, carpenter bees and cluster flies. You may want to consult with a licensed pest control operator on how to remove the insects and eliminate future infestations. It may be as simple as caulking their tunnels and painting with exterior latex. If you can't find any insects, try "scare" techniques. If you have a bird feeder that attracts woodpeckers, you might think removing your feeder will cause the bird to leave. Just the opposite may be true. 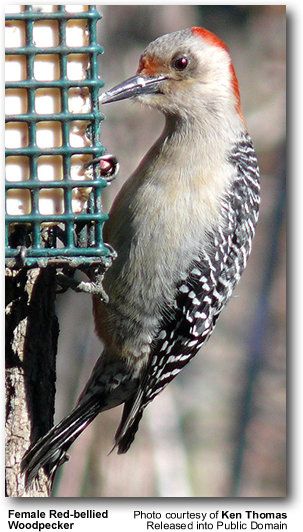 Keeping a feeder full of suet may encourage the birds not to look at your siding for food. If you have dead trees in your yard, you might think removing them (and the insects they harbor) will solve woodpecker problems. Again, the opposite may be true. Cutting down dead and decaying trees deprives these birds of nesting, drumming and food sites, and may force them to take a look at your house.